Los Angeles Rams interior defender Aaron Donald, PFF’s No. 1 ranked overall player this past season, earned a career-high and nearly perfect 99.7 overall season grade in 2017. 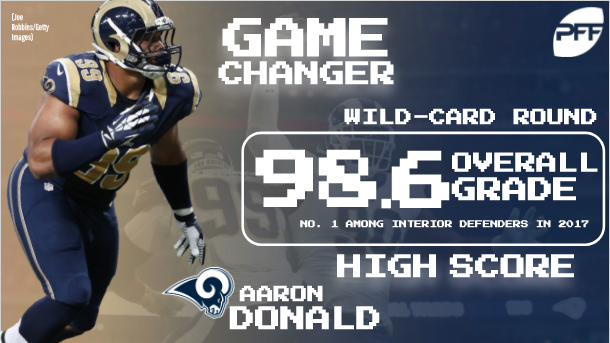 Of course, Donald’s high-end consistency wasn’t without significant peaks, as he earned three of the top-five single-game grades by an interior defender in 2017, the best of which came against the Atlanta Falcons in the wild-card round of the playoffs. Donald, despite in a losing effort, rose to the occasion in his first career playoff game. He recorded 11 total pressures and three defensive stops en route to a 98.6 overall single-game grade. Donald dominated the Falcons’ interior offensive line from the start, as he totaled 10 of his 11 pressures through the first 30 minutes of play, tying Houston Texans’ J.J. Watt for the most first half pressures recorded in a single game in the PFF era (2006-2017). Adding to his feat, Donald needed just 20 pass-rush snaps to pick up 10 total pressures, while Watt did so on 30 pass-rush snaps in 2014. Keeping Atlanta from making proper adjustments, Rams defensive coordinator Wade Phillips moved Donald up and down the line of scrimmage across multiple positions, allowing his best pass-rusher to attack different matchups. Donald recorded four pressures on 11 pass-rush snaps left of center and another seven on 23 pass-rush snaps right of center. Donald also took snaps inside the guards, opposite of the tackles and off the edge. Donald’s expansive arsenal of pass-rush moves was also on full display, beating his opposition with ranges of speed, technique and physicality. He recorded five outside pressures, four inside pressures and two bullrush pressures throughout the contest. As expected, Donald finished the game with the highest pass-rush grade (99.5) by an interior defender in 2017 with his efforts. Though overshadowed by his pass-rushing prowess, he also earned an 87.1 run-defense grade in the contest, his second-best mark of the season.